Yoëlys’ journey is just as unique as her creations. Doctor of pharmacy, this curious artist has always been attracted to nature, especially the plant world. Her studies allowed her to discover the beauty of botanical details. Yoëlys especially admires this beauty through macroscopic photography. The point of view that this length scale permits highlights the elegant complexity of nature’s creations. To materialize the inspiration that nature provides her with, Yoëlys chose felted wool. 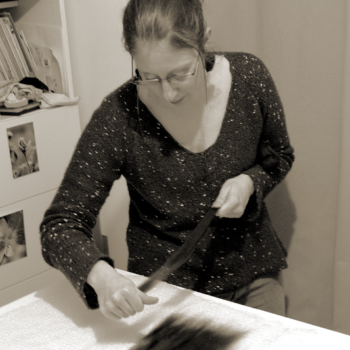 She was trained by Sandrine Bihorel, a felted wool artist who has received worldwide recognition, in order to assimilate all felting techniques. Since then, during her strolls, she carefully observes the shapes, the materials and colours of plants, mushrooms and also minerals. The laws of molecular chemistry and physics to which matter obeys, lead to the most beautiful, natural works of art. This life of constant reflection and emotion drives her to reassess her rapport with others. To limit the effects of negative emotions, Yoëlys attempts to introduce a caring atmosphere around her, which implies attentive listening, an understanding of others, indulgence towards others without giving up on her beliefs. This goodwill can be found in her work.